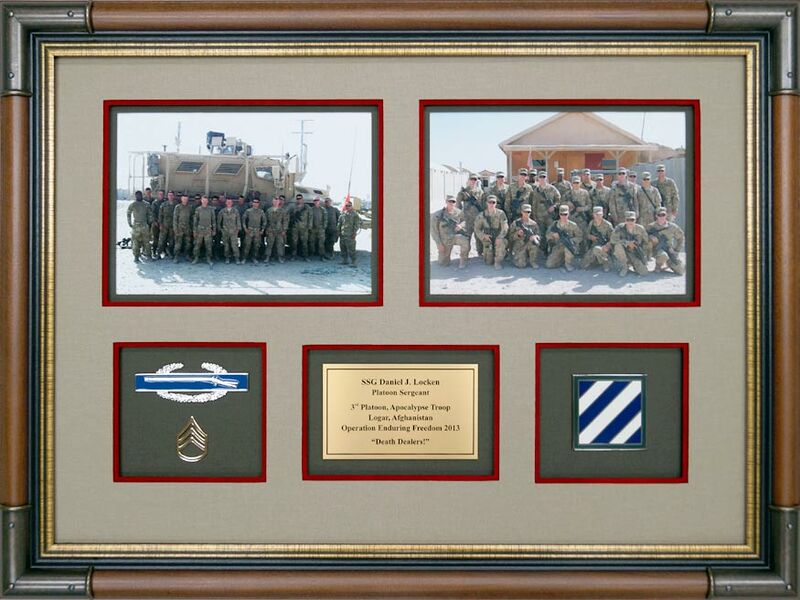 Custom framing military prints and photos is one of our specialties. We are Cindy’s Custom Framing & Antique Art, Inc. and we are located at 10070 Ford Avenue, Richmond Hill, Georgia. 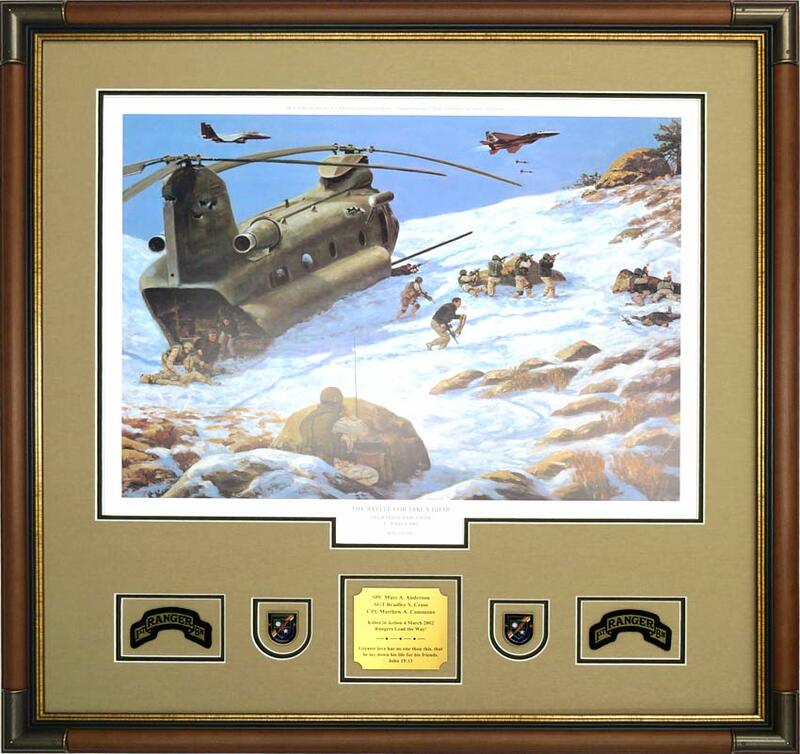 As a full-service custom picture frame shop, we custom frame military prints and photos using conservation framing materials and techniques. The example on the left is a design created for an Army Aviation unit customer. It is a collection of aviation deployment photos to commemorate the service and appreciation for men in Charlie Company 4-3 Ravens. The design features aviation wings, 3rd ID patch, unit patches, and a custom nameplate. The collection of deployment photos features triple acid-free/conservation grade mats. The top mat is an etched black paper mat, the middle mat is a red paper mat, and the bottom mat is an etched black paper mat. It is framed using a black wood frame with a silver tone fillet. A simple V-groove surrounds the prints and the objects. The glazing is 99% protective UV glass. 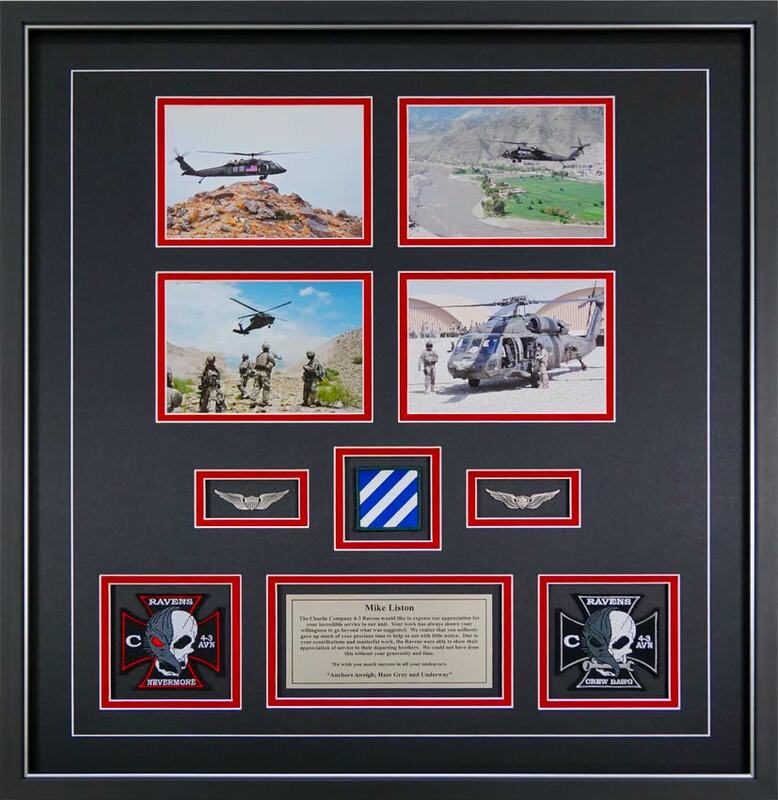 As the design for the military photos above illustrates, our goal is to offer our customers high quality, conservation grade custom picture framing for their military prints and photographs. 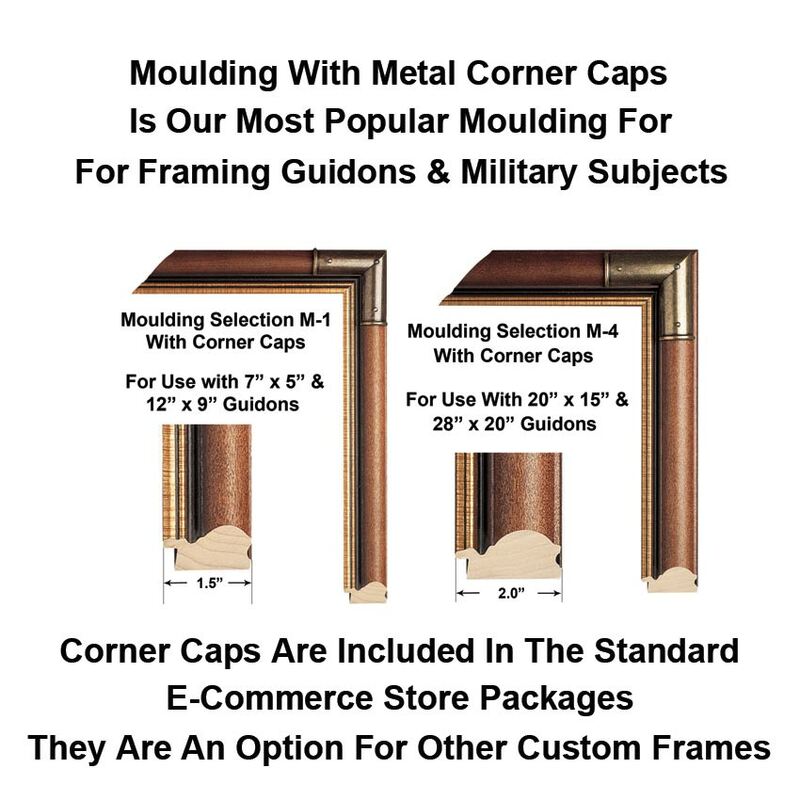 All of our picture framing conforms to the conservation grade standards outlined in our Guide To Quality Custom Military Framing page. It also means we use 99% UV protective glass or acrylic for glazing. The industry standard for conservation grade UV protective glass is 97%. So, we exceed the minimum standard for UV protective glass. Why Custom Frame Military Prints Or Photos? Military art, photos, posters, and prints capture specific events and times in a person’s life. Often prints and photos reflect tours of duty, friendships, professional associations, or a career that people hold dear. Framing prints and photos is a way to reinforce a career with a visual reference. Custom framing also permits us to share an event in our life with other people. At other times, custom framing prints and photos allows us to simply reflect upon an event or memory. We have custom framed military prints and photographs covering a number of subjects throughout the years. A special aspect of custom framing military prints and photographs is that if affords someone the ability to lock a point in time behind glass for others to see. Basically, custom framing prints and photos puts memories on display. Military memories are made every day for military personnel and represent significant events. By incorporating custom framed military prints and photos with objects, military memorabilia, or mementos, the important events are transformed into a display or a showcase for others to enjoy and view. The added benefit of framing those important memories is that they become heirlooms that can be passed down to future generations. A starting point for framing is a military print or photograph. Sometimes people bring a print to us that was given to them and they just want the print framed. As our framing design session with the customer unfolds, they will mention the relevance of the print. Often we suggest an object to include in the frame based on the design conservation about the print or photo. What we have found is that medals, ribbons, patches, rank pins, insignia, name tags, badges, coins, and nameplates work well with prints and photographs. They are small enough to be framed with the print without having to resort to the construction of a large shadow box. The key is to balance the art with a few objects that are related and have merit. Once a few items are selected, we suggest referencing the event, the time, the photograph, or the print with a custom nameplate that briefly explains the event. This is the best way to commemorate it in the frame and provide a time reference for future generations. A prime example of this is the custom pencil illustration print done by Mike T. Cherry on the left. This sketch was customized by artist Mike T. Cherry with patches, insignia, and rank. This framed military still life print is triple matted with acid-free/conservation grade mats. The top mat is a light gray mat that matches the muted shades of gray in the uniform’s camouflage. The second mat is a darker gray which matches the darker shades of gray in the uniform and the footlocker. The bottom mat is a black. The objects are mounted in the mat openings and surrounded by a standard v-groove. The glazing used for this piece is 99% UV protected glass. Beneath the illustration are distinctive unit insignias and a custom nameplate. A black matte finish wood frame surrounds the mats. This completed work illustrates the power of artist Mike Cherry and the simplicity that can be transformed into a bold statement about a military career. 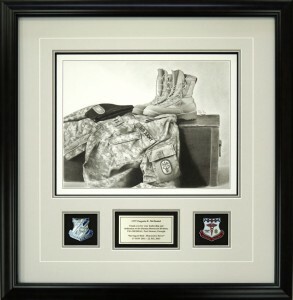 This simple pencil illustration print looks exceptionally well when balanced with objects and memorabilia to reflect a significant event in the life of a soldier. If you are interested in a pencil illustration print similar to this one, we will order for you a custom designed variation. We offer a number of framing options for framing pencil illustrations. There are a number of ways to frame military prints and photos. Some objects benefit in appearance when framed with our preferred wood molding that contains metal corner caps. The wood with metal corner caps adds strength to the military style design. In other situations, some prints and photos (especially black and white prints or pen and ink prints) look exceptionally well when framed with black matte finished frames. Other designs have a strong appeal when framed with rustic wood or distressed wood frames. Some designs are enhanced by using a silver tone or gold tone fillet with a black frame. We also have black wood frames with silver or red line edging that works well with a number of mat color combinations. The frames and mat combinations we use are designed to accentuate the art inside the frame. The mats used for framing depend on the colors in the art or the photos. Some images frame exceptionally well with etched black mats. Other photos or prints rely on the design based on the colors of the artwork or the photograph. For example, we often use mats that match the camo coloring of uniforms or surrounding terrain. Linen and suede mats add texture to the areas surrounding the art and objects. As custom picture framers, we work with customers both in our frame shop and online to frame their military prints and photos. The example on the right is an example of a custom framed limited edition print titled, The Battle For Takur Ghar by Don Stivers. 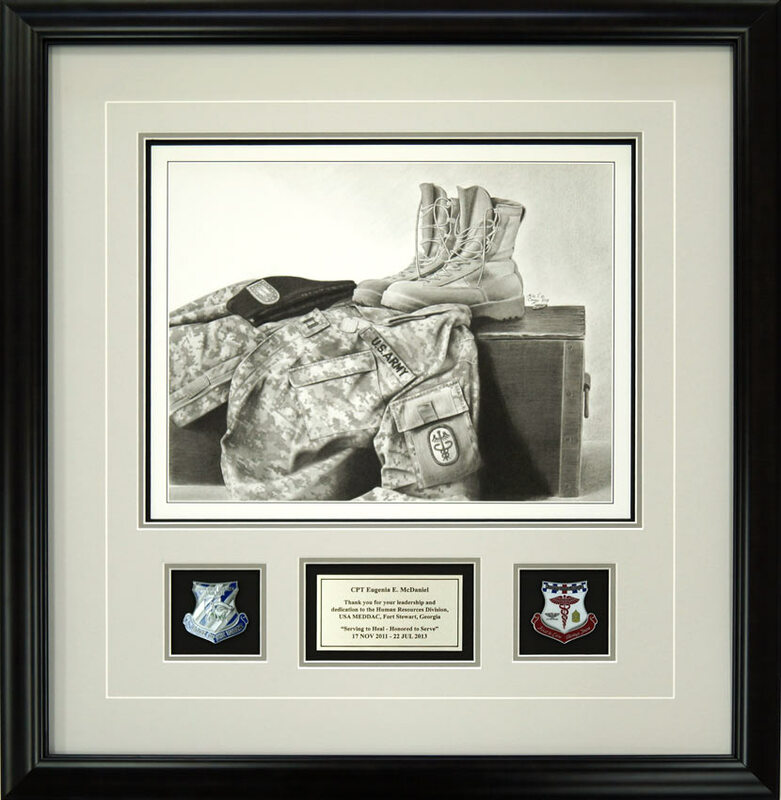 The objects beneath the print include the 1st Battalion Ranger shoulder sleeve insignias, 75th Ranger Regiment distinctive unit identification crests, and a custom gold satin finish nameplate. This limited edition print is highly collectible, and it was dry mounted flat using acid-free reversible foamboard. The triple mats are acid-free linen using complementary colors. In addition, the mats were custom cut using a computerized mat cutting program to create a drop box beneath the print with unique shapes for the unit crests. The mats, limited edition print, and objects were covered with 99% UV protected museum glass to prevent fading. This all wood frame with metal corner caps is our most popular style for military projects. Collectible photographs are also candidates for custom framing. This is especially true if they represent a duty assignment for a sailor or naval officer. 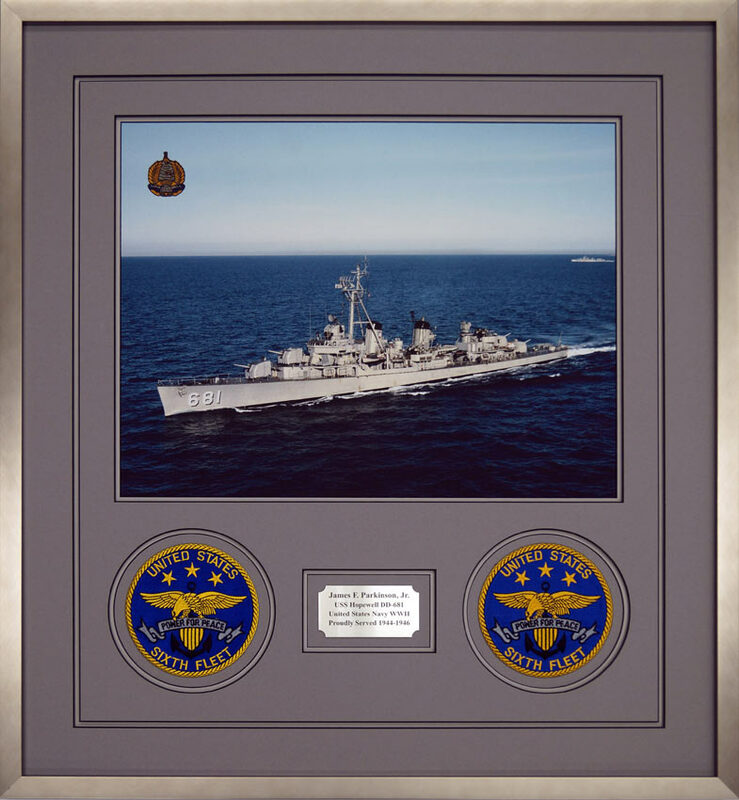 In this case, a certified naval print was custom framed to preserve a memorable experience for a sailor who served aboard it during the Korean War. The example on the left is a custom framed print of the USS Hopewell, a WWII era Fletcher-class destroyer that also saw action in Korea. 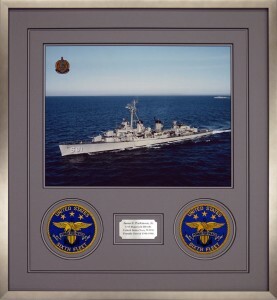 The design for this custom framed naval photograph includes two Sixth Fleet “Power For Peace” embroidered patches and a custom nameplate. The design for this includes triple acid-free/conservation black core mats. The custom mat cuts surround the objects to match their shape and size. Our signature open V-groove surrounds the photographs and the objects. A brushed silver tone frame complements the mat colors and the overall design. The project also includes 99% UV protective glass and conservation framing materials and techniques. Unique artwork for custom framing is not always on paper. 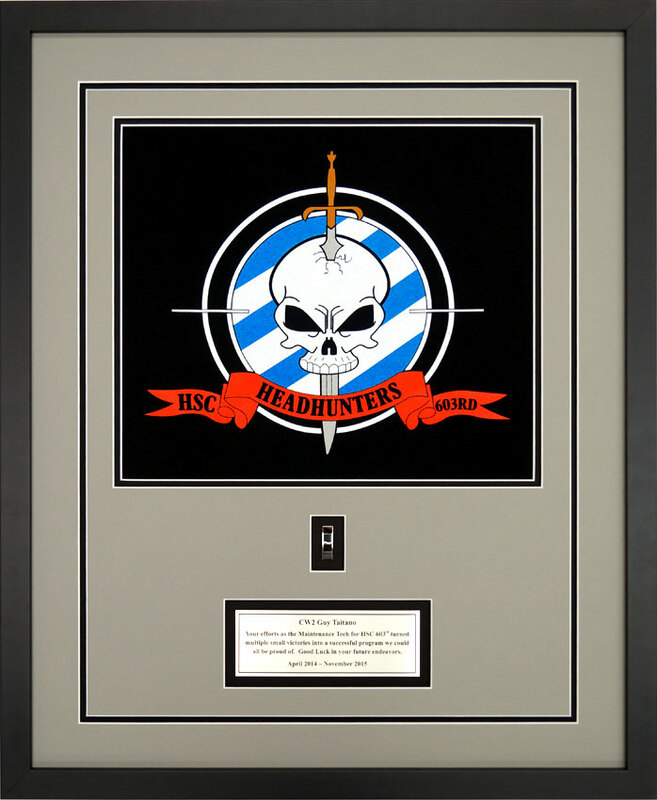 In this example, a custom framed tee shirt for Headquarters Support Company, 603rd Aviation Support Battalion was used for framing. The design used to accentuate something as common as a tee shirt involves double acid-free/conservation grade mats. The muted gray top mat serves to accentuate the black background surrounding the skull in the artwork. The bottom mat is etched black. The tee shirt was tightly sewn in place using a commercial sewing machine. It is attached to a black acid-free mat. Beneath the tee shirt is a rank pin and a custom nameplate. Our signature V-groove separates the frame from the tee shirt and the objects. A rectangular shaped black matte finish wood frame provides added contrast to the mats and highlights the artwork on the tee shirt. This project was completed using conservation grade framing materials, techniques, and 99% UV protective glass. We invite you to contact us with any questions about framing unusual objects or items, such as tee shirts. 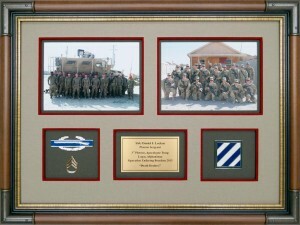 The example on the right is custom framed with Afghanistan deployment photos and military memorabilia. This set of military photos includes a design that places a combat infantry badge, rank pins, insignia, a custom nameplate, and the Third ID insignia beneath the deployment pictures. The objects are top mounted in the openings to the green linen mat. The design incorporates triple acid-free/conservation grade mats with a reverse bevel color coordinated to match the photographs. A tan linen top mat and green linen bottom mat match the camo uniform colors in the photographs. A red mat is used to separate the top and bottom mats and add depth to the design. 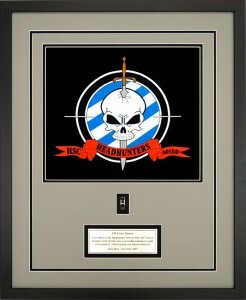 The dark Brown wood frame with metal corner caps used for this custom picture frame design is the most popular frame for military deployment photos. As custom picture framers specializing in military framing, we design each piece individually to accentuate the artwork/photographs. This piece uses acid-free/conservation grade mats, and conservation framing materials and techniques. The glazing is 99% UV protective glass. We invite you to spend some time reviewing the examples of our completed works. If you see something that is similar to what you have in mind, please contact us. We will gladly create a design that reflects your military print or photo in a meaningful and memorable way.